How recently have you replaced an atlas in your household - or classroom, or library? Mountains and coastlines may be as fixed as the rock of ages, but flags, borders and capital cities in certain parts of the world have an annoying habit of changing all too frequently, as publishers are well aware. So the decision to buy a primary atlas in paperback and replace it regularly is probably a wise one, and for a general purpose atlas this paperback edition from Kingfisher will provide adequate support for homework. 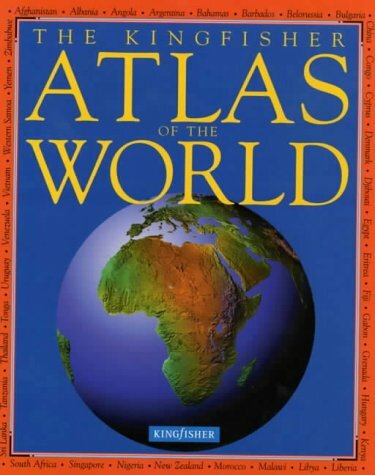 Originally published in hardback in 1997, this edition has been updated in 2001, offering straightforward, descriptive coverage of major countries of the world and including facts and figures about each continent. The maps are clear enough, but not particularly detailed or attractive. An introductory page includes a simple key and basic guidance on how to read maps, but there is no information given about the projection used. Photographs of physical features and cities are supplemented by some patchy artwork (traditional costumes and local delicacies make frequent appearances). Reasonable value at $$9.99, there are better offerings elsewhere from the main cartographic publishing houses.